You may not think a pineapple smoothie would benefit from the addition of vegetables and nutmeg, but trust me – it does! You get a serving of fruit, a serving of veggies, a little warming spice, a shot of vitamin C, and NO added sugar – all in one tasty glass. 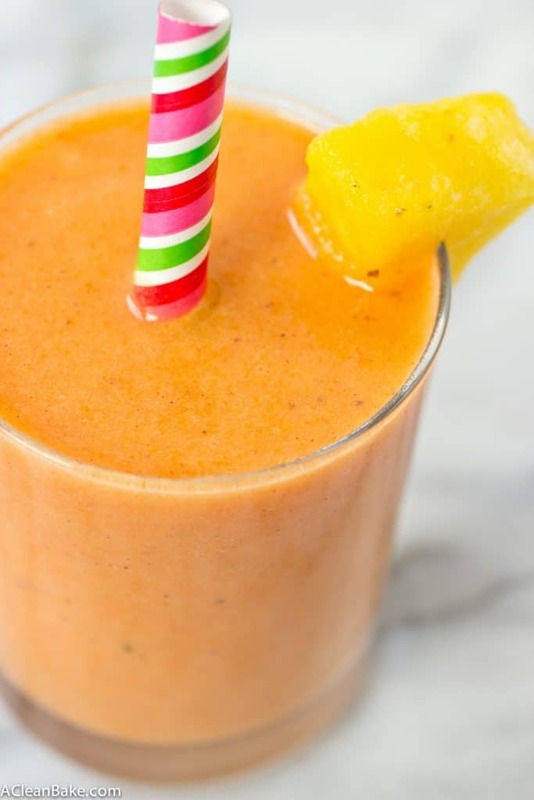 Once you try this pineapple smoothie recipe, you won’t be able to put it down! Whether or not the world needs, let alone wants, another healthy smoothie is debatable, but at the moment, we have more pressing concerns. Namely: did you have any idea that pineapple and nutmeg go so well together? I didn’t even consider it until I had a drink at this innovative cocktail bar that combined pineapple juice, nutmeg, and – in its typical fashion – one million other flavors, and it was spectacular. I don’t know about you, but I am a little boozed out after the holidays, so a healthy, nutritious pineapple smoothie (with nutmeg!) is much more appealing than a(nother) cocktail. This drink provides all the health and flavor benefits of the pineapple-nutmeg duo, but also incorporates an ingredient I have never used in a smoothie before: carrots. I just couldn’t bring myself to post another green smoothie, but I don’t like how sugary all-fruit smoothies can be. 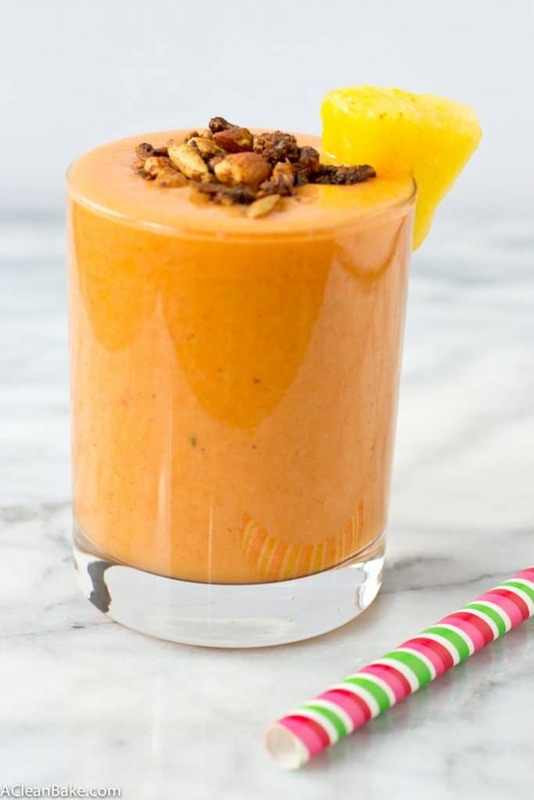 Carrots work great in juices, so why not smoothies? 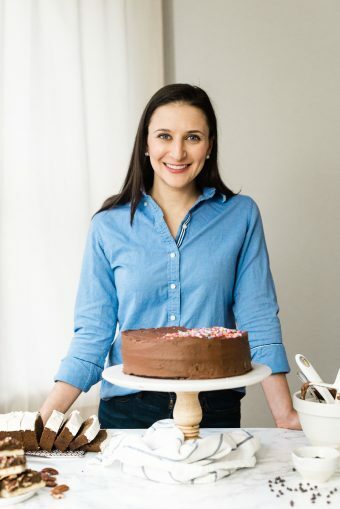 Well, I’ll tell you why not: when raw, they never fully break down in the blender and end up tainting your silky smooth drink with chunky, fibrous bits of crunchy vegetable – it’s neither appetizing nor entirely choke-proof. Gross. The solution is to quick cook them in the microwave, and then let them cool very slightly so they are soft enough to puree but not so hot that they melt the frozen fruit in the drink. 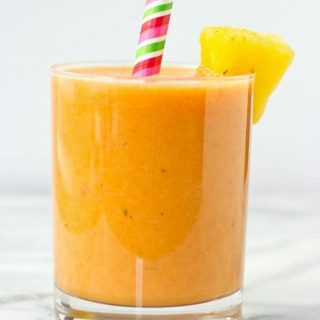 What else is in this refreshing smoothie? For creaminess: Frozen banana and coconut milk, Greek yogurt (extra protein! ), or plain yogurt of choice. To finish: Top with a sprinkle of granola for texture and maybe even a dusting of cinnamon or nutmeg for added flavor (not that you need it) and you’re in business. You may not think a pineapple smoothie would benefit from the addition of vegetables and nutmeg, but trust me – it does! Once you try it, you won’t be able to put this pineapple smoothie down! Place the carrots in a microwave-safe bowl and cover 3/4 high with water. Cover the bowl and microwave on high for 3 minutes, or until softened. Drain the water and allow carrots to cool until they are at least comfortable to touch, and ideally at room temperature. Combine all of the ingredients in your blender and puree on the high (liquefy) setting until smooth. Add more liquid as needed to keep things moving, and/or more spices to taste. Pour into your glass, garnish with and a dusting of nutmeg if desired, and serve immediately. If you don't have or want to use pineapple juice, you can use any citrus juice (orange or grapefruit would be great), coconut water or tap water. You can replace the pineapple juice with extra coconut milk for a richer, extra-creamy smoothie. And you can replace some or all of the banana and/or coconut milk with Greek yogurt or your plain yogurt of choice. This is so gloriously orange! Love that it comes from cooked carrots. Also – PINEAPPLE AND NUTMEG –> you have just blown my mind. Isn’t the color great!? I love a green smoothie, of course, but this one is just such a nice change of pace! Oh, girl! We are on the same page today…bucking the trend of green juices and green smoothies–you with a colorful smoothie and me with a pink juice. We both shot on marble, too. 🙂 Nora, your smoothie is amazing. 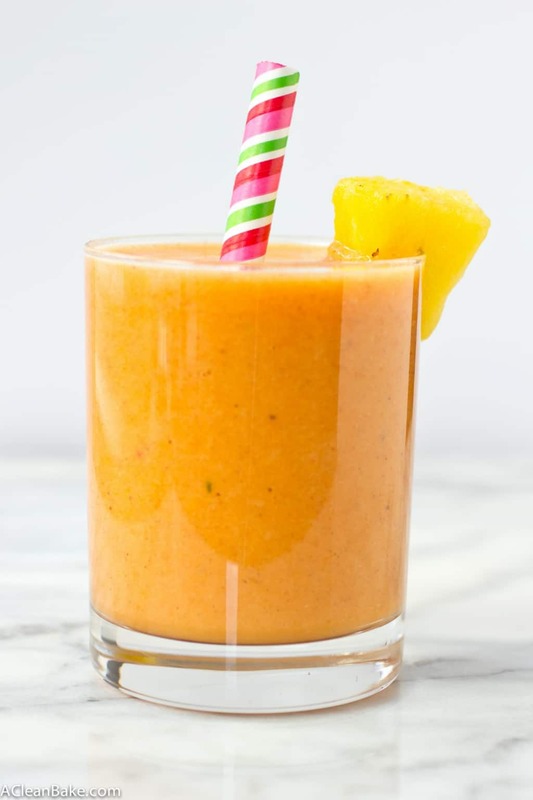 My absolute favorite spices are anise and nutmeg, and I adore both carrot and pineapple juices, so I can’t wait to try your special smoothie…soon! It looks absolutely divine with your stellar photography and I like that whisper of cinnamon, too. Thanks for sharing! Great minds think alike, I guess!! I have been behind on my feed lately so I haven’t seen your smoothie yet but I am so looking forward to it now! The world definitely does need another healthy smoothie recipe! Especially when it looks as amazing as yours! Love the pineapple and nutmeg combo! Perfect for a post workout snack! Pinned! Thanks, Lindsey and I appreciate you sharing it!! I’m so glad you offered up this smoothie, Nora! It’s fabulous! The coconut milk with pineapple, carrot and nutmeg sounds just delicious, even in the cold of winter! It’s just vibrant! I’ll have to grab a pineapple next time I’m at the store and whip this one up! Thank you, Nora! I hope you love it, Traci! By the way, if fresh pineapples are hard to come by, frozen and slightly thawed will work just fine! This detox smoothie looks and sounds amazing, Nora! Love the pineapple, so fresh and adding nutmeg is great! Definitely cannot wait to try the recipe out! It looks delicious! I will try it soon. I had never had think about nutmeg and pineapple, sounds really good! Thanks, Azu! I hope you like it! I made this tonight for the first time and it became a keeper from the first sip, but there was enough left after filling my glass for my Mom to have and try. When she said it was really good w/out having to ask!?! Not only a keeper, but a out of the park Grand Slam Home Run!! It’s been a battle and then some since my Ceilac was discovered to, at the very least, get the support from her when it comes to the diet that I should be getting. Don’t ask, as it’s a very long story, but when I find something like this….It’s a very big deal, so Thank You, Thank You, Thank You!!! You are so incredibly welcome, Denise!! I am thrilled to hear your mom enjoyed the smoothie too 🙂 I’m so sorry to hear that you haven’t been getting the support you deserve to stay healthy, but I hope this is a step in the right direction!! Ooh I never thought of combining pineapple and nutmeg in a smoothie but it sounds like the two flavors would go spectacularly together! (: Gosh, such a healthy drink! Nicely done! Yeah, me either, until I had that cocktail. I was so surprised how well the two flavors complement each other! Okay I am going to go buy pineapple chunks just to try this. I have a smoothie every day for breakfast so its gonna be nice to change things up! Yes, do it!! Let me know what you think!